Services the commercial coin-op industry with custom built arcade cabinets, cutting edge game designs, and coin-op redemption units. Contains details of two coin box projects. Site includes designs, images, video, and technical details. Coin-op pinball and arcade games for sale. Repairs of all types of coin-op amusement devices. Located in California, United States. A 68-page monthly publication that covers the world of Pinballs, Jukeboxes, Slot Machines, Soda Machines, Arcade, Classic Arcade Video, and the coin-op collecting hobby. Manufacturer and distributor of coin-operated machines and video games. Custom builds and sell parts for refurbished arcade and cherry master coin-operated machines. A dealer in authentic arcade game equipment for use in the home. They buy, sell, and service most makes and models of pinball machines and other arcade or coin-operated types of equipment. Features game information, images of ads as well as pictures of classic games, and links. Classic Arcade Gaming chronicles the history of the golden age of coin-op video gaming including the games, players, contests, and scores. Sells new and used coin-op gaming equipment. Offers discount coin-op and arcade games. Arcade cabinet manufacturing for the coin-op industry and home market. Arcade machine sales to the coin operated amusement industry. Manufacturer of coin operated arcade pods with updatable games. Exporter of re-conditioned coin-op arcade and gaming machines from Japan. A coin-operated game database with more than 11,000 machines featuring pictures and information. A source for coin-operated and home arcade equipment in Texas. Video game, pinball and arcade machines. Located in Massachusetts, United States. Outlet for coin-op sales and rentals in southern Florida including video arcade games and simulators. Specializing in the repair and restoration of pinball, jukebox, arcade games, and coin operated equipment in the New England Area. A coin-operated machine database with pictures, trivia, and tips. Dedicated to collecting and restoring classic coin-op and console video games. Repair and refurbishment of coin-operated mechanical and electronic pinball machines in Bucks County, PA.
New and used arcade games, pool tables, foosball tables, juke boxes, and dart machines for home or business. Buys, sells, trades, and services commercial coin-op arcade equipment and jukeboxes. Specializing in unusual and classic electro-mechanical pinball games. Located in New Jersey. Wholesale arcade machines, pinball, jukeboxes, and dart machines catering to dealers and collectors. Located in the Washington DC area, United States. New and used coin-op games for home or business in NW Wisconsin. U.S. and Canadian coin machines, coin operated games, kiddy rides and inflatables. If the business hours of GameArchive: Video Games Homepage in may vary on holidays like Valentine’s Day, Washington’s Birthday, St. Patrick’s Day, Easter, Easter eve and Mother’s day. We display standard opening hours and price ranges in our profile site. We recommend to check out gamearchive.com/Video_Games/ for further information. 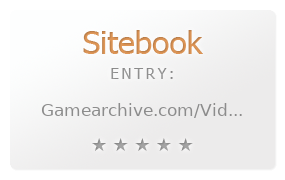 You can also search for Alternatives for gamearchive.com/Video_Games/ on our Review Site Sitebook.org All trademarks are the property of their respective owners. If we should delete this entry, please send us a short E-Mail.